Sometimes breakfast demands to be elaborate. The usual toast and eggs or muesli simply don't make the cut and the heart demands something more. And then, if it's Kali Pujo, the demands are louder. Since I don't make luchis very often I decided Kali Pujo was a special enough occasion to put aside all thoughts of counting calories and carbs and to simply indulge. 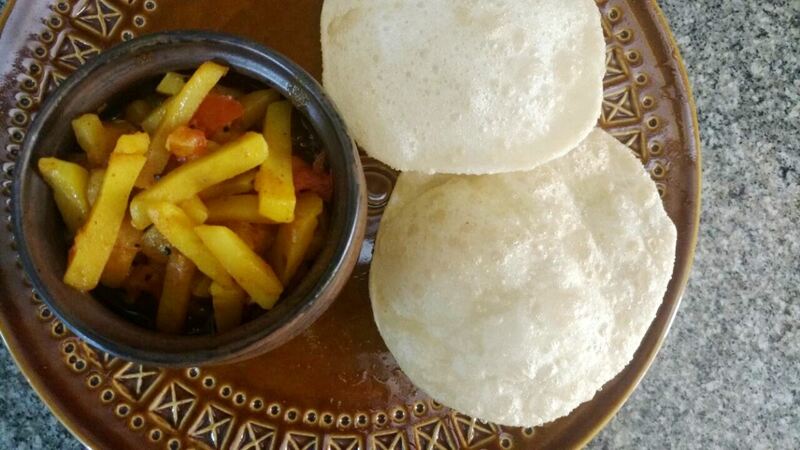 And thus we had luchi and alu'r torkari for breakfast today. 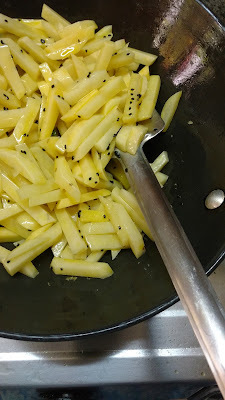 Now there are many different kinds of alu'r torkari, or potato preparations, that can be paired with luchis, the pale, pure maida Bengali puris. From a simple alu bhaja (fried potato) to a more elaborate alu'r dom, alu phulkopi, sada alu'r torkari, Bengalis have a wide range of options. 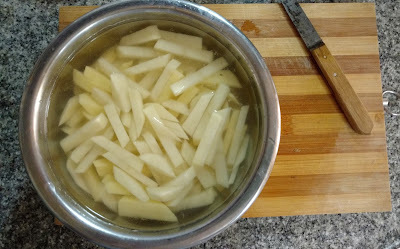 One that my mom used to make very frequently was a lomba kaata alu'r torkari. This is a very simple preparation with barely any spices or ingredients and is absolutely delicious. It's also quick to cook which makes it perfect for breakfast. Once in a way mom would make this early in the morning for our school tiffins too. She'd roll up luchis with the torkari tucked inside and put three or four rolls in the box, enough for me and my friends to have a high treat at tiffin break! Cut the potatoes into matchsticks, not too thin. You can retain the peel, make sure you wash the potatoes really well. 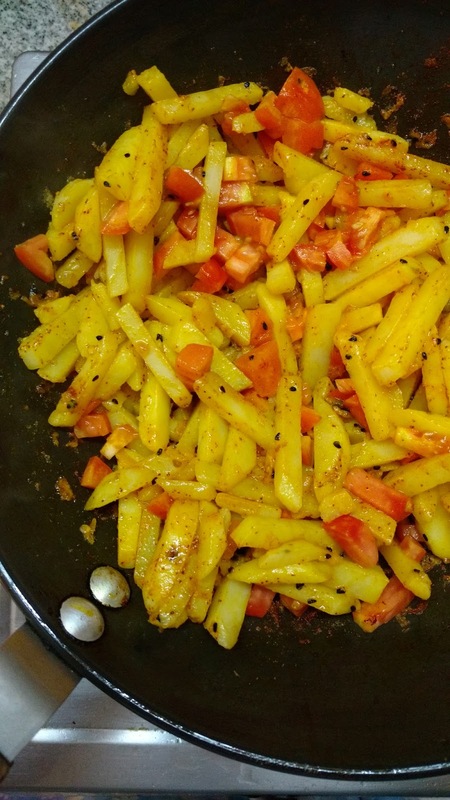 Heat mustard oil in a wok or kadai and once it's properly hot chuck in the green chillies followed by the kalonji. Once the kalonji finishes sizzling, add the potatoes. Stir well to coat the potatoes with the oil and kalonji seeds. Cover the wok and lower the flame, let the potatoes cook for a couple of minutes. Do not let the potatoes brown. 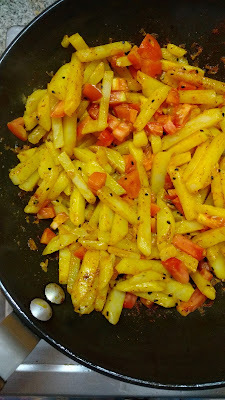 Once the potatoes are translucent add the salt, turmeric, chilli powder, and tomato and stir properly to mix well. Let it cook for a bit, a couple of minutes. Now add enough water to just cover the potatoes. Bring it to a boil and cook uncovered till the potatoes are done and the water nearly dried up. This dish doesn't have a gravy, but don't let the water dry out completely. The gravy should be barely there, just coating the potatoes. 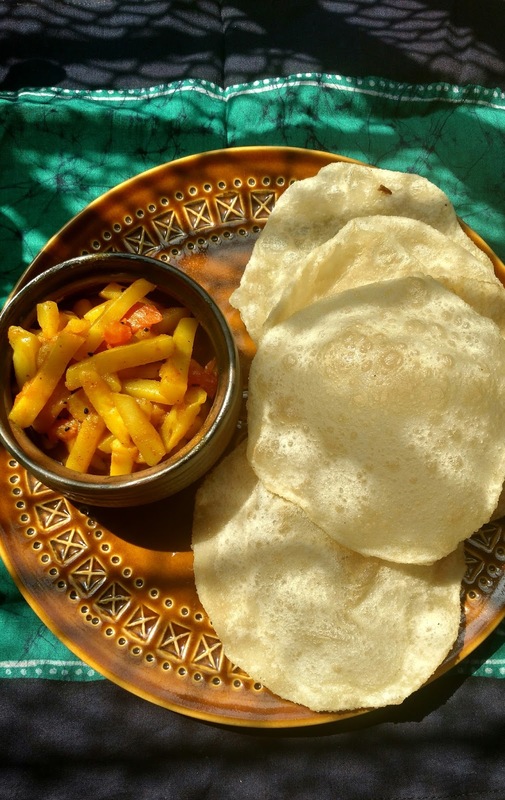 Here's the recipe for Bengali luchi. This torkari goes well with porota and with regular everyday rotis too. Mom made it for dinner paired with rotis quite often. 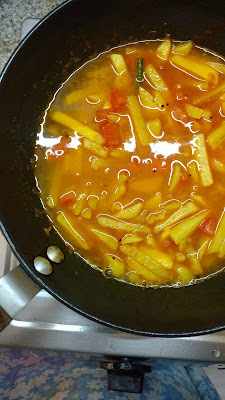 On days when you'r short of ingredients this torkari can be a lifesaver. For me, this torkari is something I associate very strongly with my mother - memories of Sunday breakfasts and special dabbas for for school. Such a simple torkari, but so much more than just a torkari.